Kick start your summer in the best possible way with Summer Solstice Yoga! Join us for an evening of yoga to celebrate the Summer Solstice at Robert Mondavi Winery. Rejuvenate your body and spirit with a yoga practice set amidst our beautiful To Kalon vineyard and backdrop of the Mayacamas mountains. Suitable for all levels, this yoga session is a perfect way to honor the sun, the beginning of summer and the light in each one of us. 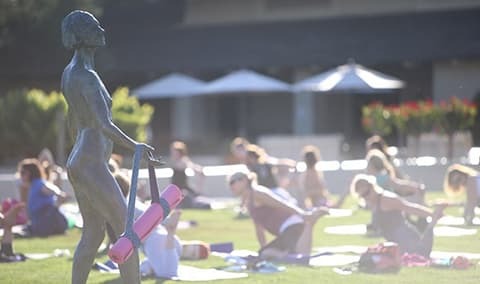 Following the 75-minute yoga practice on our spacious lawn, you’ll savor the sunset and cool down with a glass of wine accompanied by healthy gourmet treats. Please Note: Participants must be 21 years and older.